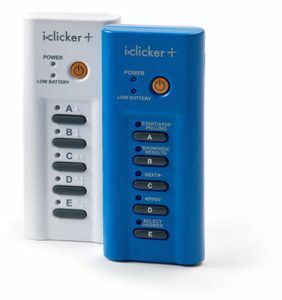 In iClicker systems, each student uses an app for their mobile device or a device, an “iClicker”, that looks like a TV remote to answer questions posed by the instructor. Summaries of student responses can be shown in real time to both instructors and students. Answers are stored electronically for later viewing. For student iClicker devices, instructors need to contact the Rutgers Bookstore prior to the start of the semester and inform them of how many devices they will need to run their courses. The Bookstore will then make sure that enough devices or student access codes for mobile apps are acquired for student purchase. iClicker Classic – How do I install it as an instructor?